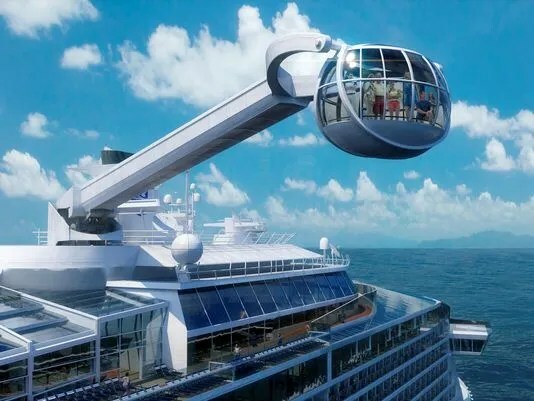 NEW YORK — Royal Caribbean’s next ship will feature a giant mechanical arm that transports passengers high above the vessel in a glass capsule. Dubbed the North Star, the unusual contraption aboard the line’s Quantum of the Seas will be designed to give around 14 passengers at a time a “whole different perspective” of the environment in which they are vacationing, Royal Caribbean Cruises chairman and CEO Richard Fain tells USA TODAY. Speaking in advance of an event today in New York to announce plans for the 4,180-passenger ship, Fain said the ride takes a page from the London Eye and other attractions around the globe that give vacationers a bird’s eye view. “Quite frankly, the success of the London Eye had a lot to do with this,” Fain said. Unlike the London Eye, which costs more than $25 per person to ride, however, the North Star attraction will come with no extra charge to Quantum of the Seas passengers. Royal Caribbean long has been known as an innovator in the cruise industry, with past ships pioneering such things as rock climbing walls, ice skating rinks and surfing pools. The line caters to a broad international audience with 22 large, resort-like vessels that carry as many as 6,000 passengers a piece. — Virtual balconies for interior cabins. 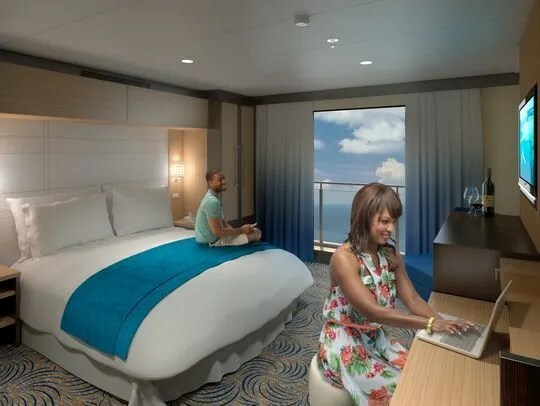 Expanding on an idea pioneered two years ago on a Disney cruise ship, 373 windowless “inside cabins” on each of Royal Caribbean’s new ships will offer real-time views of the sea from high-tech walls. “It is dramatic,” says Fain of the effect, which he says only has become possible with recent advances in technology. Fain credits Disney for proving that the concept of an electronic window for interior cabins could work with the “virtual portholes” built into inside cabins on the new Disney Dream and Disney Fantasy. — An unusual new entertainment venue called Two70°. The multi-level, high-tech “great room” will offer immersive entertainment including aerialists and other live performers daily. Located at the back of the ship, the space will feature floor-to-ceiling glass walls spanning almost three decks and is named after its 270-degree panoramic sea views. — The largest indoor sports and entertainment venue at sea. 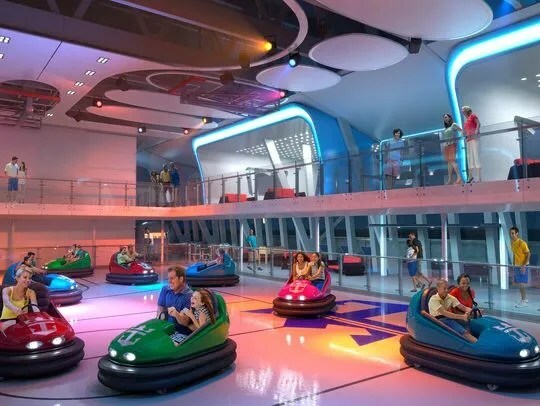 Dubbed SeaPlex, this multi-deck fun zone will feature bumper cars — a cruise industry first — as well as roller skating; a circus school with flying trapeze; a full-size basketball court; dancing and more. — The first skydiving experience at sea. Located atop the ships, The RipCord by iFly attractions are vertical wind tunnels that simulate the experience of skydiving. — A multi-purpose performance venue called Music Hall. The two-story area will boast live performances, music with DJs, theme night parties and billiards. Royal Caribbean also announced that cabins on Quantum of the Seas will be about 9% larger, on average, than cabins on its last class of vessels. The ship also will have the largest variety of cabins in the Royal Caribbean fleet, including 28 Studio cabins for singles. Twelve of the Studio cabins will be exterior cabins with balconies — a rarity in the industry; The rest will be interior cabins. The vessel also will cater to multi-generational families with cabins of differing layouts that connect to form up to 16 large “Family-Connected” complexes. Additional plans for the ship announced at the New York event include such Royal Caribbean staples as an adults-only Solarium, along with an outdoor pool, a new indoor pool with operable roof and a H2O Zone kids’ aqua park. Other signature features found on earlier Royal Caribbean ships that are making a comeback include a rock climbing wall, FlowRider surf simulator, Adventure Ocean children’s program and a Royal Babies and Tots Nursery. Additional details about dining and entertainment on Quantum of the Seas will be unveiled in the coming months, the line says. At 167,800 gross registered tons, Quantum of the Seas and Anthem of the Seas will be smaller than Royal Caribbean’s record-breaking, 225,000-ton Oasis Class vessels but still among the biggest cruise ships afloat. Ordered in early 2011 and early 2012, respectively, the ships are under construction at the Meyer Werft shipyard in Papenburg, Germany. Royal Caribbean said today that Quantum of the Seas will sail out of the New York area after it debuts in 2014 on seven- to 12-night trips. Itineraries for Anthem of the Seas have yet to be announced. Bookings for Quantum of the Seas will be available to members of the line’s frequent cruiser club, the Crown & Anchor Society, starting on May 27 before opening to the general public on June 4.